On Earth, people tend to think of craters as giant holes in the ground like Meteor Crater in Arizona, ancient features too big to miss that mark the site of a catastrophic collision with an asteroid or comet. But craters can also be small objects, like the two discovered recently by the Opportunity rover on the plains of Meridiani on Mars. 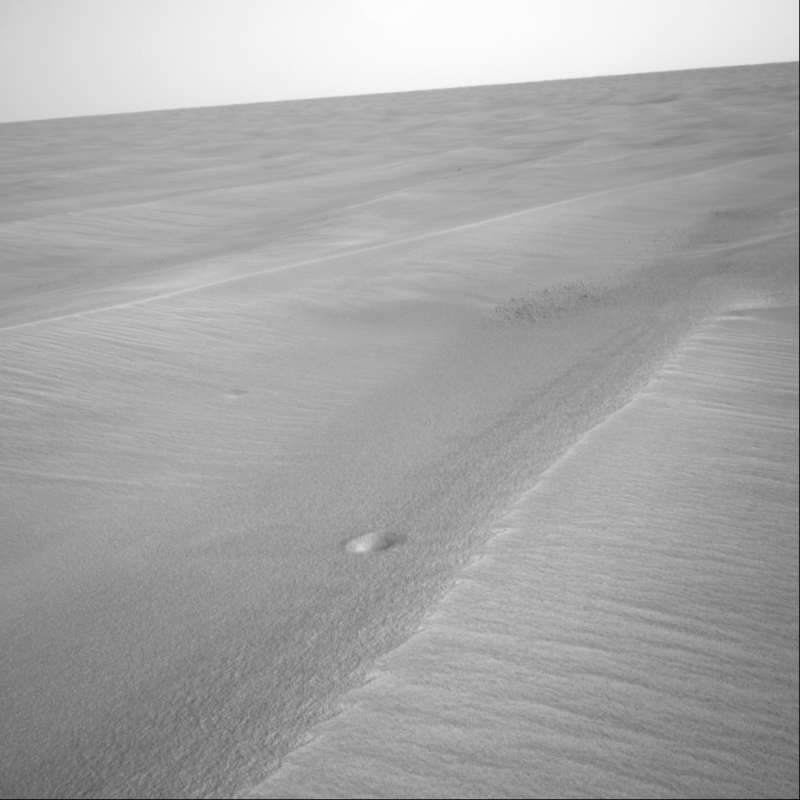 Both are less than half an inch deep and clearly visible in images taken by the rover's navigation cameras. "These are the smallest craters yet observed by either rover," said Matt Golombek, a veteran Mars researcher at NASA's Jet Propulsion Laboratory and principal scientist on the Mars Exploration Rover mission. "I think the smallest crater we saw in Gusev Crater (where Opportunity's twin, the Spirit rover, is exploring the other side of Mars) was 40 centimeters (15.7 inches) wide and that was in a hollow that had already been filled by sand and sediment." The largest of the two craters discovered by Opportunity is only half as big, measuring 20 centimeters (7.9 inches) in diameter and 1 centimeter (0.4 inches) deep. The smallest of the two is 10 centimeters (3.9 inches) wide and less than 1 centimeter deep. Opportunity took pictures of the two tiny craters with its left and right navigation cameras, creating a stereo image that allowed scientists to measure their distance and size. On Earth, small craters are not commonly recognized because they're quickly filled with dirt, pine needles, or other debris carried by water and wind. On Mars, craters are primarily filled by wind-blown sediment, though in the past they may also have been filled by lava, melting ice, or flowing water. "Given that these two craters haven't been covered by sand even though they are surrounded by sand ripples on a flat plain lends support to the idea that they're fairly recent," said Golombek. "Of course, recent might mean any time from yesterday to 100 million years ago." Both are impact craters formed either by an object from space that was large enough to make it through the martian atmosphere without burning up or by rock fragments ejected from a larger crater that formed when something crashed into the martian surface. "Come to think of it," added Golombek, "there were also no small, fresh craters seen by the previous three martian landers, which include Pathfinder and the two Viking landers. These are the smallest craters yet seen on Mars." Golombek was project scientist for the Pathfinder mission.